Give me 20 minutes a day and I’ll show you how to spend less time cleaning and tidying and instead have MORE time enjoying life with your family without having to dump all your belongings on the bed and see which sparks joy! When I was little my biggest most earnest desire was to feel special. Feel like the whole universe revolved around me & my whims. Yes, every child is the same and things don’t change much when we get older right? So today I am here to make YOU feel like THE most special person to ever walk the face of the internet. I am releasing my latest version of my program and you are the first to know about it! Clear The Clutter is THE ONLY system that declutters your home in just 20 minutes a day. Created by a mom who knows what it is like to be time poor, for moms who don’t have time to be folding knickers in some weird origami way. A proven system that works for all families and home situations. And that is easy to follow even without a binder full of printables and worksheets. Would you rather listen to baby shark 24/7 than tackle the chaos in your cupboards because you fear that if you do it, in 2 months time you will be facing the same chaos again? Are you ready to sell your family to the circus if you hear "I can't find my..." one more time, or have to deal with yet another meltdown or argument over missed bill payments or lost 'important' papers? Do you start the day with good intentions but run out of steam because it feels like a never ending clutter hell hole, you can't seem to get ahead with the cleaning because tidying up is taking all your time? Are you starting to believe you are destined to spend the rest of your life living in chaos, it's bad enough trying to deal with your own stuff but it's 10x worse when you add the rest of the family to the mess. Do you feel stressed, depressed or embarrassed by the mess in your home and dread the ping-pong of the doorbell with unannounced visitors? We have a lot in common you and I, both busy mamas juggling the kids, the home, the wifey duties, the laundry and everything else that life dumps on us. Yes I run a decluttering program but that's because I'm not naturally tidy person, I don't have OCD tendencies and I'd rather be sat, feet up with a large glass of wine (substitute drink of choice) than picking up after the kids or dusting the ornaments! I know what works and how to get the cleaning done quickly, I want to share those tricks with you. It's true, I really do hate cleaning that much, which is why (as the laziest cleaning mama on earth) I have devised a way to keep the house spick and span with minimum time and effort. I used to get really grumpy, no really, really grumpy when I had to spend my weekends cleaning, when what I wanted to do is kick back and have fun with the rest of the family. Or if I wasn't doing it at the weekend, I was having to squeeze it in during the week which just left me exhausted and fed up and too knackered at the weekend to do anything fun. Finding a system that fit into my day, that was easy and I could do it without being constantly exhausted was magic and I have shared that system with hundreds of other moms, it works for them too. Hint: It is all to do with getting rid of all the clutter! Kaizen in it's purest form simply means "improvement" by adding tiny kaizen steps to your day each day is slightly better than the one before. By breaking everything down into itty-bitty baby steps it is EASY (perfect for lazy people like myself). The Clear The Clutter system is designed so you have one small, easily doable job to do every second day, that’s right you get a day off between jobs. Sounds good already right? Each job, if tackled without distractions (I am talking social media here!) and on average should be achievable in 20 minutes or less. That is less than 20 minutes for every 48 hours. And as you deep declutter you will have less crap in the house to clean around, making the general up keep of the house easier and quicker - genius! Even if I do say so myself. Thousands of other women around the world feel exactly like you and do you know what? I can help you. You just need to take the first step. My proven Clear The Clutter system will allow you tackle the house in bite sized chunks and still have a life! You don’t even have to think, just read the mission for the day and do it. I will guide you through a deep clean of each room, freeing you of your clutter and allowing you to take back control so that you can fall in love with your home again. 4. I understand about kids! When trying to find the best way to keep the chaos under control I found a lot of 'experts' that had all these brilliant ideas BUT were clueless when it came to kids. Your house might have looked like something from Home and Garden magazine pre-kids but once those little monkeys arrive on the scene, it's whole different ball game! I spent half of my adult life working with kids, I studied and taught Montessori - famous for it's beautiful environment set up. I know what the problems are and how to solve them and I'm always available in the private Facebook group if you need help or to brainstorm some ideas. It's important for your kids to know how to look after their environment and take responsibility for their belongings, yes even toddlers can learn how to do this, it just needs you to guide them. Even if you were raised in a home where clutter was the norm, you now have the power to break that cycle and show your kids a better way. We discovered that my husband had a really deep seated fear of decluttering. It felt like losing something important even when it was junk or actually something of mine or the children's. It took CTC and a lot of conversations (some got quite loud, lol) but he's now worked through a fear that he didn't really know he had and is now enjoying the benefits of actually being able to find the stuff that is important to him. The kids have taken responsibility for not just their own belongings and mess but for general family stuff too. They'd decluttered their rooms with me helping them before but there was something about being part of CTC that seemed to make them switch over to "I can do this myself" and then to not needing to even be reminded, just automatically decluttering if they saw things building up. My eldest daughter now lives out at uni and despite being the youngest of her flatmates by several years, is the most organised and tidy of them. She was also happier about moving out than she would have been because she knew she wasn't leaving me in a messy house trying to deal with things without her, so she moved out without feeling so worried about me. And then there's me. Clutter really stresses me out and being in a mess can make me feel very down. Because I'm not able bodied (professionally wonky) and because I have a very variable condition, things can build up very easily and then I'm stuck, immobile, with nothing to do but look at the mess. Not a good situation. Now the house is organised I can keep on top of cleaning far more easily and I learned to break down the housework into manageable chunks, spread out across the week. I might not have a 'day off' but I also don't have any heavy days at all and nothing builds up, it's much easier and if I do have to miss a day, I can catch up again easily. Because I have a routine it's also easier for the rest of the family to know what needs doing and help out, which is great because I am quite spectacularly useless at asking for help! I love to sew, crochet and draw but everything was stashed all over the place and it had become a massive hassle to find the stuff I needed. Now I know where everything is I can grab something to do in a minute and being able to make things keeps me happy. I never need to have a manic tidy up if people visit, or worry about people seeing a mess when I answer the door, all thanks to Jo and CTC. 5. There is nothing to think about! Pop on some of your favourite tunes or a podcast and know that each of these tiny steps will cut time down on your organising, cleaning and general home keeper duties for the future. The knock on effect of this is that it is getting you into a new habit so that when you graduate from CTC you have an established routine to stick to making it so much easer to keep the house as you want it. who are in the thick of it, like you and I. Clear The Clutter started in 2013, we have had hundreds of amazing women join the bootcamps and the program, from all four corners of the world. Using tiny steps to make huge changes in their lives. Not only do we work on getting the clutter out of your house, we work on your mindset to stop you bringing more clutter in <-- Most decluttering programs totally miss this point so after a year you are back where you started but with new clutter! This is not just a decluttering program, this will change your life and how your family deal with their environment, such important life lessons for our kids! What I like about the course as a mum of a 5 yo and 20 m old, working full time, is that even though my weekly cleaner is great and takes care of the regular surface jobs, clear the clutter enables me to do the deeper clean maintenance jobs and be mindful of what I use and buy. I'm not quite a minimalist yet but I have certainly reduced what I bring into the house. The two reasons that Clear The Clutter works so well are first, using the kaizen method to break the enormous job into manageable steps and secondly the group support, accountability and camaraderie. I'll be completely honest here, I had no idea that cleaning and decluttering could be so much fun! Having a whole group of people cheering you on and praising your efforts is amazing. I also love that some amazing friendships have been made with course members too, it's one happy family! And fun, did I already mention it is fun? Because I believe someone as special as you should have access to something as special as this…it’s a match made in heaven and I am just a humble match-maker! Click on the red button below and get started ASAP! Because by this time next week, you will be basking in the knowledge that you are not only special but also an action-taker and an excuse-buster. The bedroom is still looking good after the CTC makeover earlier this year--that is still the room I'm most proud of, I think. 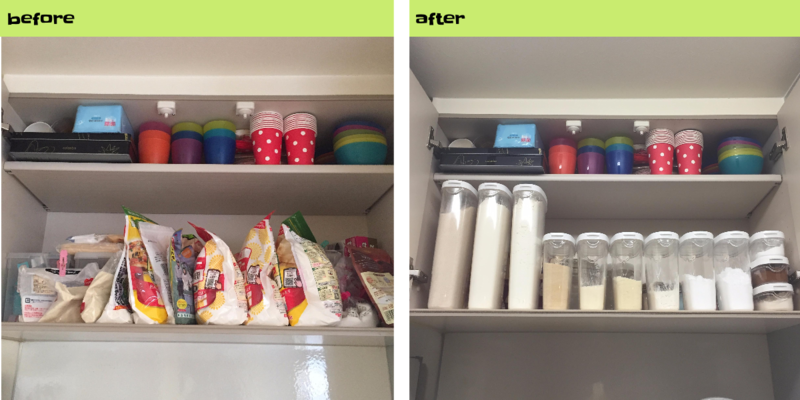 It's easy to get caught up in the rapture of tidying our room of the month, but just wanted to share how it continues to make a difference later on. This feels like a life changer. Tonight DH told me that this cleaning spur I've been on feels like a dream for him. That he had already given up hope of ever living in a home that was clean and peaceful. 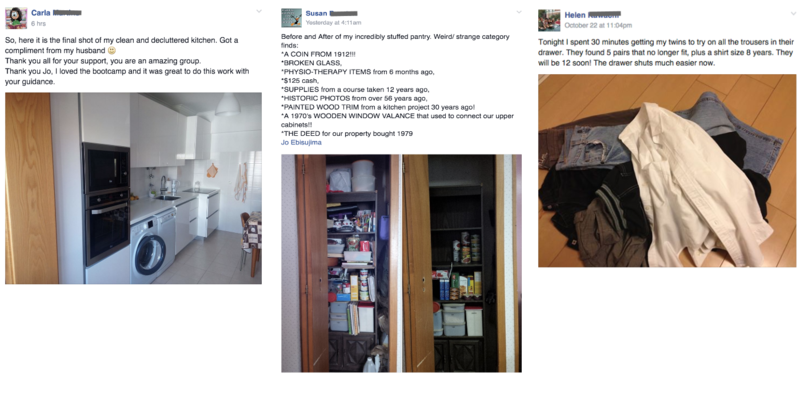 I've been part of Jo's Clear the Clutter group for a few months now, and it's been really great. I can see areas of my home really coming together, and the changes are, at least so far, sticking. 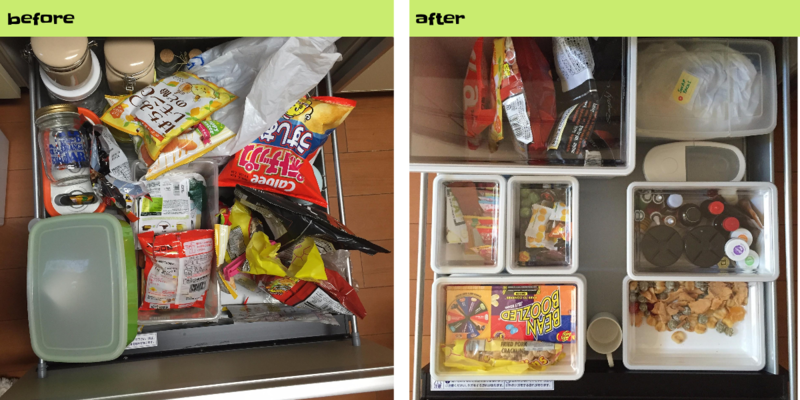 My entry/genkan clean up the other day was a non-issue because we tackled that back in August, and things are still tidy and organized. The pace on CTC is less frenetic than here, and the members are a lot of fun. I highly recommend it! We got home last night from a short family trip to Tokyo. It think it was the first time I've ever come home to a tidy house! I never seem to be able to leave the house in a tidy state before going away because there's always too much mess to deal with when I'm busy packing etc, but this time I just needed to do a quick pick up before we left. It was so nice to come home to a clean house! It lessened the disappointment of the trip being over. I have gotten SO much done the past couple of weeks! Thanks Jo Ebisujima for doing this; it was just the kick in the pants I needed! What you said about every item having a home really clicked with me, and has helped a lot. I just found today $60 in iTunes gift cards that my husband lost a couple of Christmases ago and another $20 gift card. Today was profitable! I'm doing Jo's Clear the Clutter too and I totally agree with everything Meg said! I actually had trouble finding things to do for the Holiday Havoc challenges because I've already got rid of most of the clutter and I am managing to keep my place tidy thanks to CTC! I found a $25 iTunes card, about 1000 yen in change, and a brand new bra still in it's wrapping! Major score, considering how hard it is to find supportive undergarments in Japan. You invest in a yearly subscription to Clear The Clutter, as soon as you sign up you will receive the first mission email April 1st, from there, they are sent out every second day. The email will give you a task to do for the day. The task shouldn’t take more than 20 minutes, you can go and brag about your achievement on the Facebook group. Then sit back and wait for the next email, simple as that! Each month we focus on a specific room or area and give is a good de-clutter and a deep clean. A month may seem like a long time but realistically, how long did it take you to accumulate all that clutter and wouldn’t you prefer to do the job well once than half assed several times? 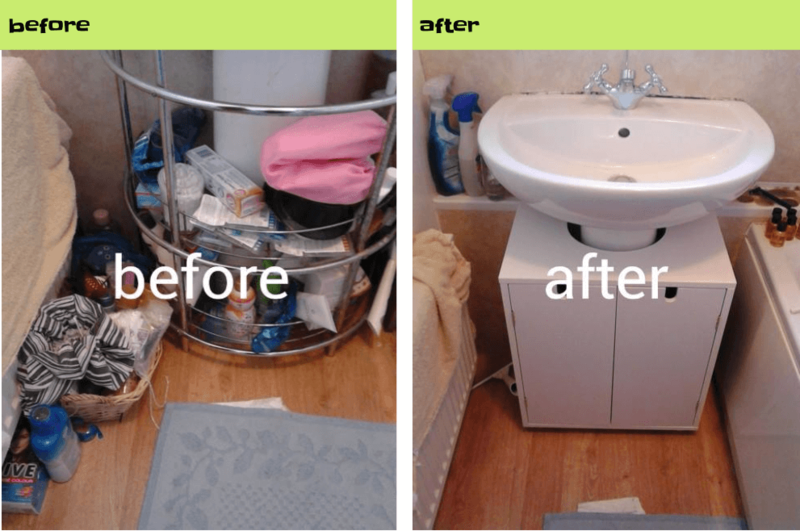 The course also includes big clean months, to tackle those areas that often get forgotten. Does the thought of your efforts having a knock on effect to the rest of the family appeal ? And having their help and support as you work as a team rather than you do all the donkey work sound good? Then Clear The Clutter is for you. As you progress through each month you will feel more motivated and inspired. You will feel less guilty and start to get a buzz from throwing stuff out. You will feel liberated and the dynamics of your family will change for the better. There will be less stress, less bickering and instead more co-operation and help. Then when you have completed the month not only will you have a beautiful room, you will feel proud and have a space where you want to linger, somewhere which is now a pleasure to sit in. You might not even realise that along the way, you will have had a mind shift, you will start to look at the room differently and your attitude to housekeeping will change. The knock on effects have been amazing. I feel far more organised and far less stressed since I started the Clear The Clutter program. I joined just to get the house organised but it is so much more than that, thank you Jo! The family have actually started putting things away. We now have a home for everything and it's much easier to find and put things away. 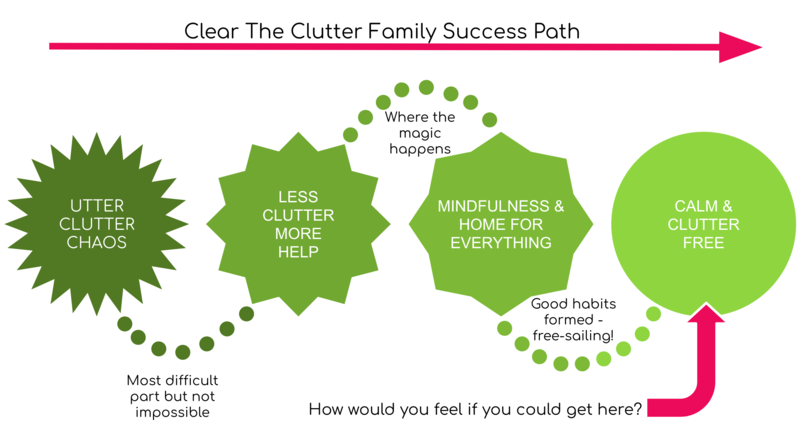 I can't recommend Jo's Clear The Clutter course enough, it has saved my sanity! Starting from the day you invest, you will get sent an email every 2 days with your challenge for the day. We concentrate on one area of the home at a time and give it a really deep decluttering. Not just whizzing around with a bag, getting rid of surface clutter. Due to me being in Japan and you being, well probably somewhere else, we use PayPal to process all transactions, it is secure and easy to pay online. If you have any problems when it come to making the payment contact me and I or my team will help sort it out for you. You will billed on the same date every month/year. For annual payments you will get a reminder at the start of the billing month that your payment is coming up. I'm sure you'll agree that it took a long time, possibly years for your home to get into the crazy state it's in, so all that crap is not all going to disappear overnight. What my clients find it the first year they give their home the deep clean and declutter it really needs. The second year it is easier to pare things down and take a good look at what at what is left. Often sentiment gets in the way first round but by the second round, you are ready emotionally to let things go. By year three, you are working in maintenance mode, keeping your home exactly how you want it, many clients stay on because they like getting the email reminders. Of course, as soon as you are ready to go it alone, you can cancel your subscription. You will be billed on the same day each year. Only those paying from a Japanese account will be charged 8% tax, this will be calculated automatically when you invest. No worries, you're subscription will stay at the same rate, it will never increase..
Sure! Most of my clients use the first year to dig deep and have a good clear out and the second year is weeding out the things they didn't feel they could chuck out the first time round. After that is it maintenance, some people like to stay on to get the reminders so they can stay on top of everything. If you want to quit drop us a line and we will sort you out. If, up to 14 days after you sign up, you are not completely satisfied with the course then I will refund your investment, but I truly believe that if you follow the course and put the work in, you will see great results. You usual cleaning supplies and that's it. You may as you go along decide to invest in some new storage items or you might find once the clutter is cleared out you don't need as much as you has before! What will your life look like one year from now if you don't start today? I can tell you - exactly like it does now but with one years worth of added clutter into the mix. Or you could do the sensible thing, start today and this time next year you will be sitting pretty! "Always say 'yes' to the present moment... Surrender to what is. Say 'yes' to life - and see how life starts suddenly to start working for you rather than against you."